Scott Sommerdorf | The Salt Lake Tribune Bingham's Yoeli Childs and Copper Hills' Porter Hawkins battle for a rebound during second half play. Copper Hills beat Bingham 52-49 on the road in South Jordan, Friday, February 6, 2015. 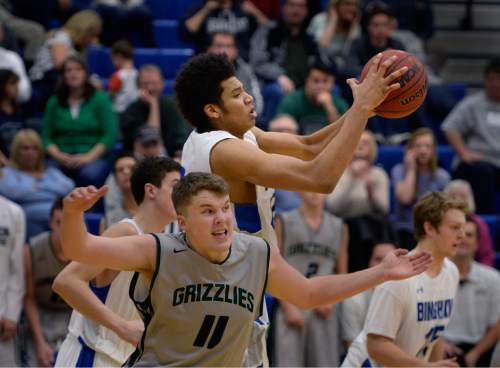 Scott Sommerdorf | The Salt Lake Tribune Bingham's Yoeli Childs snags a rebound over Copper Hills' Porter Hawkins during second half play. Copper Hills beat Bingham 52-49 on the road in South Jordan, Friday, February 6, 2015. 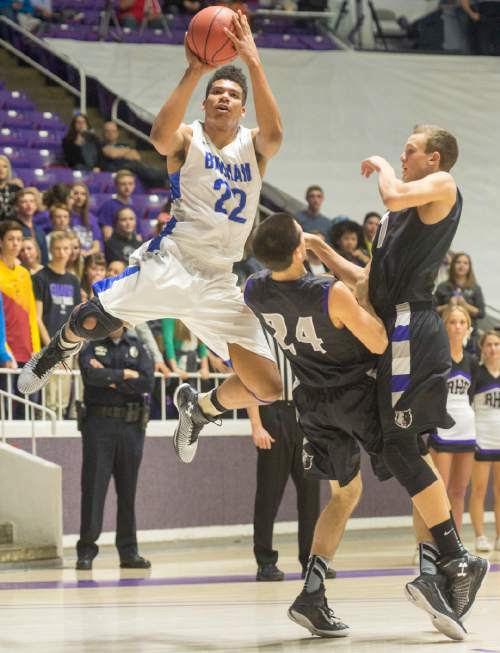 Rick Egan | The Salt Lake Tribune Bingham forward Yoeli Childs (22) fakes out the defense and takes a open shot for the Miners, in 5A Boys Basketball State Tournament action, Bingham vs Riverton, at the Dee Event Center, Monday, February 23, 2015 Rick Egan | The Salt Lake Tribune Riverton guard Joseph Andrews (20) gets by Bingham forward Yoeli Childs (22) for two points, in 5A Boys Basketball State Tournament action, Bingham vs Riverton, at the Dee Event Center, Monday, February 23, 2015 Rick Egan | The Salt Lake Tribune Bingham forward Yoeli Childs (22) gets tangled up with Riverton center Dakota Rodriguez (44), in 5A Boys Basketball State Tournament action, Bingham vs Riverton, at the Dee Event Center, Monday, February 23, 2015 Rick Egan | The Salt Lake Tribune Bingham forward Yoeli Childs (22) dunks the ball, in 5A Boys Basketball State Tournament action, Bingham vs Riverton, at the Dee Event Center, Monday, February 23, 2015 Steve Griffin | The Salt Lake Tribune Lone Peak's Frank Jackson leaps into the air as he throws down a dunk over American Fork's Spencer Johnson during game between American Fork and Lone Peak at UVU UCCU Arena in Provo, Tuesday, February 10, 2015. 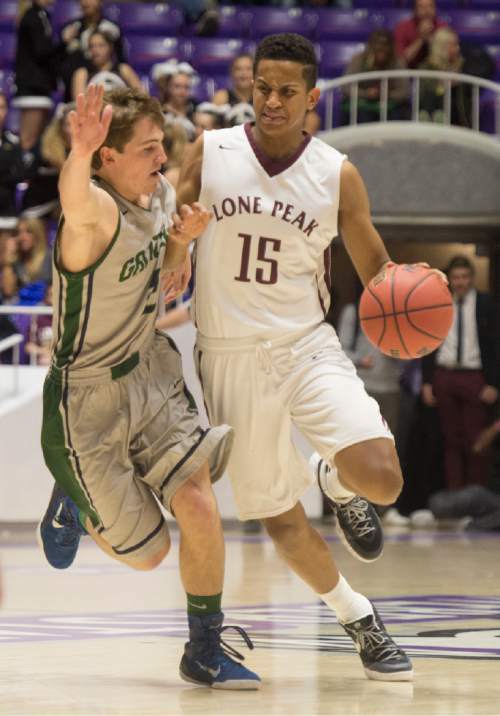 Rick Egan | The Salt Lake Tribune Lone Peak guard Franklin Jackson (15) brings the ball down court as Copper Hills guard Trevor Hoffman (2) denends, in 5A Boys Basketball StateTournament action, Lone Peak vs Copper Hills, at the Dee Event Center, Monday, February 23, 2015 Rick Egan | The Salt Lake Tribune Lone Peak guard Franklin Jackson (15) scores on an easy lay-up, in 5A Boys Basketball StateTournament action, Lone Peak vs Copper Hills, at the Dee Event Center, Monday, February 23, 2015 Chris Detrick | The Salt Lake Tribune Kearns' Bushmen Ebet (1) dunks past Bountiful's Jake Lasalle (3) during the game at Kearns High School Friday January 30, 2015. 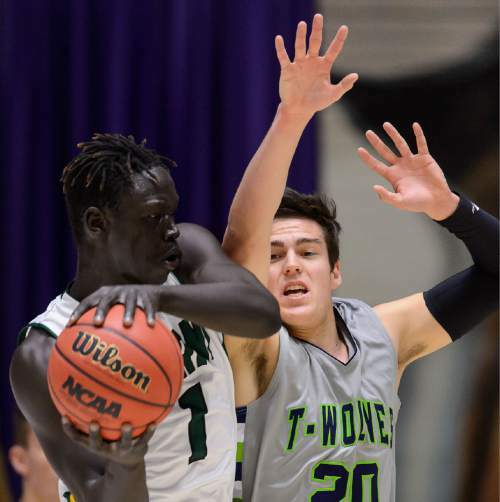 Trent Nelson | The Salt Lake Tribune Kearns's Bushmen Ebet (1), defended by Timpanogos's Arthur Coombs IV as Kearns faces Timpanogos High School in the state 4A boys basketball tournament at the Dee Events Center in Ogden, Tuesday February 24, 2015. 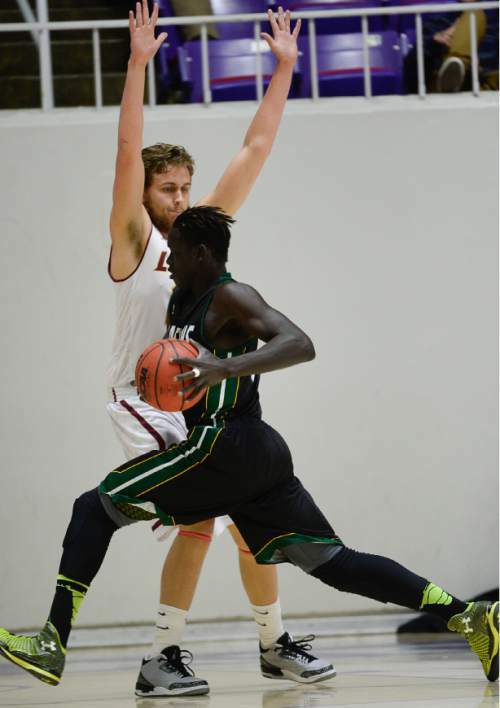 Francisco Kjolseth | The Salt Lake Tribune Kearns's Bushmen Ebet (1) pushes past Logan's Kevin Andersen (20) in 4A boys' hoops quarterfinal at the Dee Events Center in Ogden on Thursday, Feb. 26, 2015. 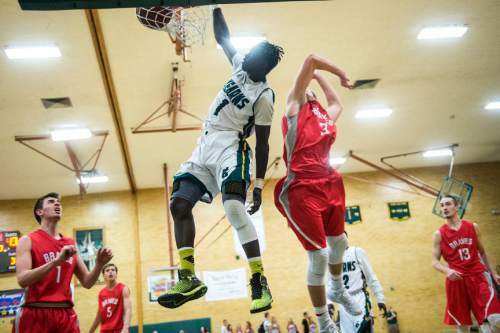 Francisco Kjolseth | The Salt Lake Tribune Kearns's Bushmen Ebet (1) keeps a ball in play over Logan in 4A boys' hoops quarterfinal at the Dee Events Center in Ogden on Thursday, Feb. 26, 2015. 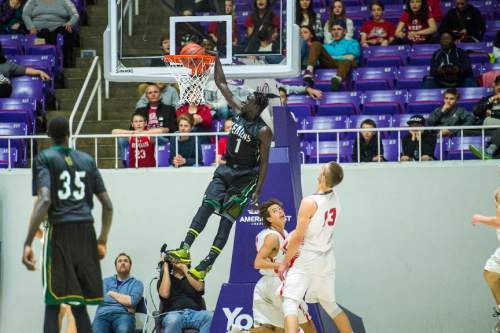 Chris Detrick | The Salt Lake Tribune Kearns's Bushmen Ebet (1) dunks over Bountiful's Austin Parkinson (5) and Bountiful's Jeffrey Pollard (13) during the 4A championship game at the Dee Events Center Saturday February 28, 2015. 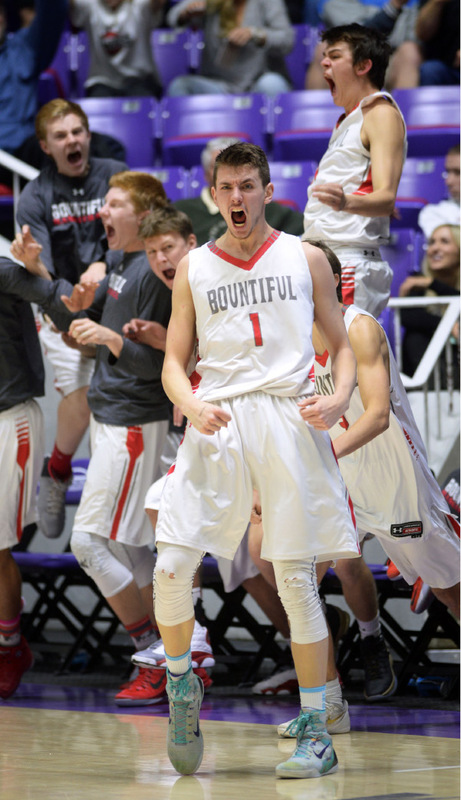 Bountiful is winning the game 36-16 at halftime. 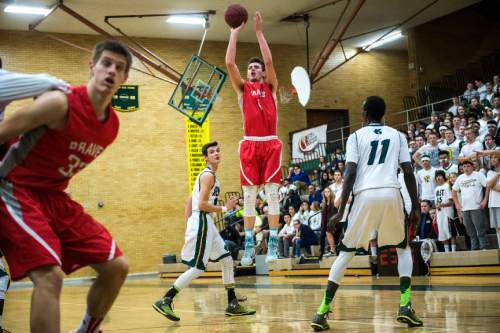 Chris Detrick | The Salt Lake Tribune Bountiful's Zac Seljaas (1) shoots past Kearns' Tayler Marteliz (10) and Kearns' Buay Kuajian (11) during the game at Kearns High School Friday January 30, 2015. 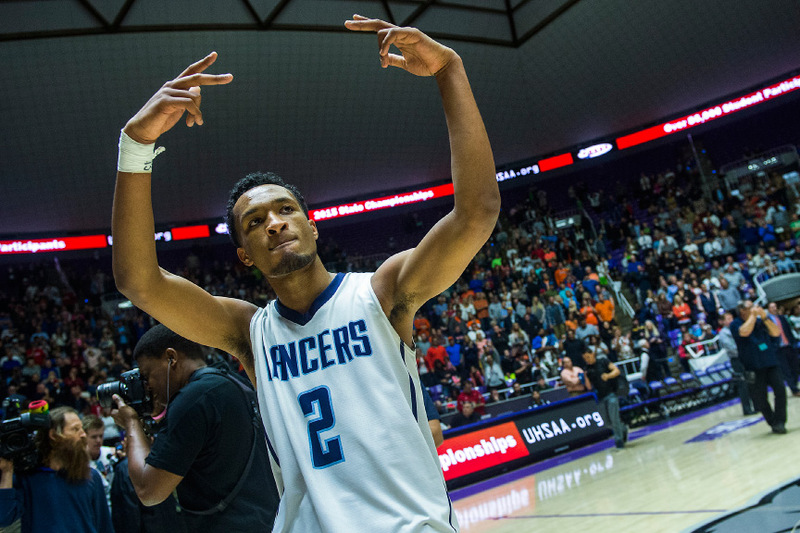 Blackmon led the Lancers to their first 5A boys&apos; basketball championship since 1988. 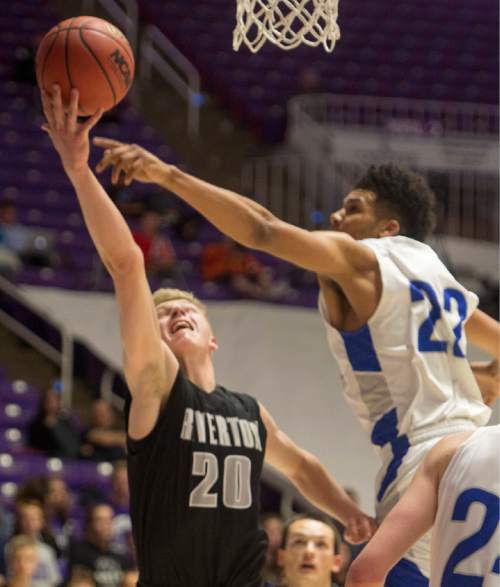 His effort in his team&apos;s 48-46 win over Brighton in the final was typical of his value during an 18-7 season where Layton finished second in Region 1. He scored 14 points and hauled down seven rebounds. He became known as much for his defense as his scoring ability. "You can&apos;t quantify what he meant to our team," Layton coach Kelby Miller said about his Santa Barbara-bound star who averaged a double-double this season. "Just his ability to impact the game in so many ways and so many levels was immeasurable. Defensively, around the rim, players had to know where he was at because of the shots he blocks and alters. Offensively, he was a hard guy to guard one-on-one." The senior star known for his spectacular dunks helped the Cougars&apos; surprising run to their first state title game appearance since 1972. 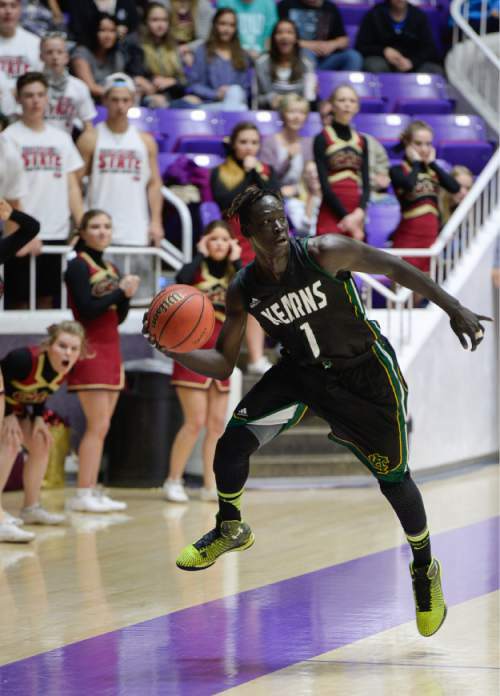 Before losing to Bountiful in the title game, Kearns won 14 of its last 15 games, with Ebet leading a fun-to-watch pressing defense that featured many steals. "I never had to tell him to hustle," said Kearns coach Dan Cosby, who praised Ebet for his incredible work ethic. "His instincts for the game, of being in the passing lane and knowing where the ball was going on defense were impressive. I don&apos;t see a lot of high school kids with his court presence. The fact he was the steals leader for two years in a row speaks for itself." 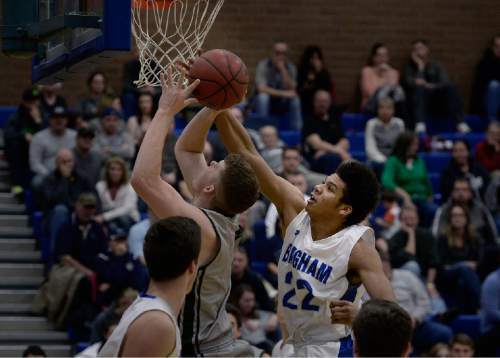 Seljaas, who is headed to BYU, provided one of the state tournament&apos;s biggest highlights when he hit a buzzer-beating 3-point shot to beat Murray in the first round of the Class 4A tournament. He led the Braves to their second straight state championship by beating helping his team beat Kearns 66-54 in the title game, a run that capped a 19-game winning streak to end the season. 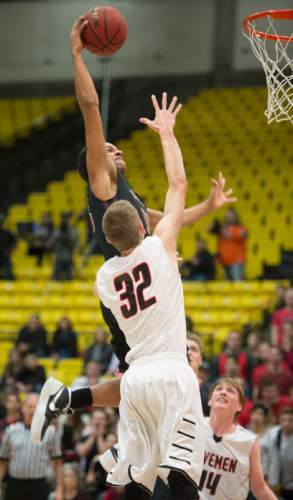 Bountiful coach Mike Maxwell said what made Seljaas&apos; season a challenge is that he needed to learn to become a point guard. "That is not easy to learn," said the veteran Braves coach. "It is one of the most difficult spots to pick up. It took a few games to get his feet under him, then he knew what we needed. … Being a shooter made that even tougher because that was his first inclination. He had to learn how to get everyone else involved." Maxwell said learning that position should help Seljaas at BYU, where he plans to play a year before going on a church mission. The coach described his star player as a quiet leader who worked hard and made certain the other players knew what was expected of them. "Frank is an elite scorer and an elite competitor," said Lone Peak coach Quincy Lewis, who noted that Jackson had a 54-point game during the season, one of the top individual efforts in state history. "He does not like to lose. Scoring the ball, he is as good or better than anybody I have ever had." That&apos;s saying something considering the fact that Lewis has coached some of the highest scoring prep players in recent seasons. Jackson led the Knights to the Region 4 title and an 18-7 record against some of the best competition in both Utah and around the country. 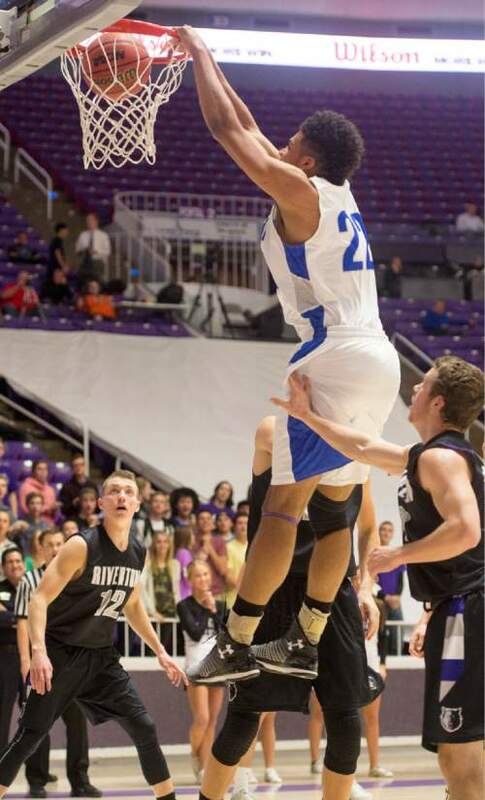 His return next season promises to keep the Utah County team among the state&apos;s and the nation&apos;s elite teams. Childs is the kind of transcendent talent who has the ability to change games by blocking shots, grabbing rebounds and electrifying crowds with dunks. 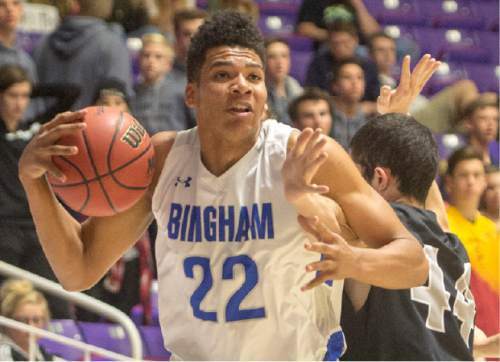 "He was vital to our success," said Bingham coach Jake Schroeder. "The comparison with him in the game and with him out of it was amazing. He made us a better team. He was one of the better rebounders I have been around. Offensively, he demanded so much that it opened things up for other guys. … He was one of our best passers. Everything we did went through him." Due in part to Childs&apos; efforts, the Miners ran away with the Region 3 title and finished with a 20-4 record. Tribune and TribPreps staff used personal observations, analysis of season statistics, and input from coaches throughout the state to select an All-Tribune MVP and an additional five-member All-Tribune Team. These players were selected from throughout the state and regardless of classification.